So, interesting little thing. After all these years of using Facebook, I've managed to gather several maps just like the one to the left. 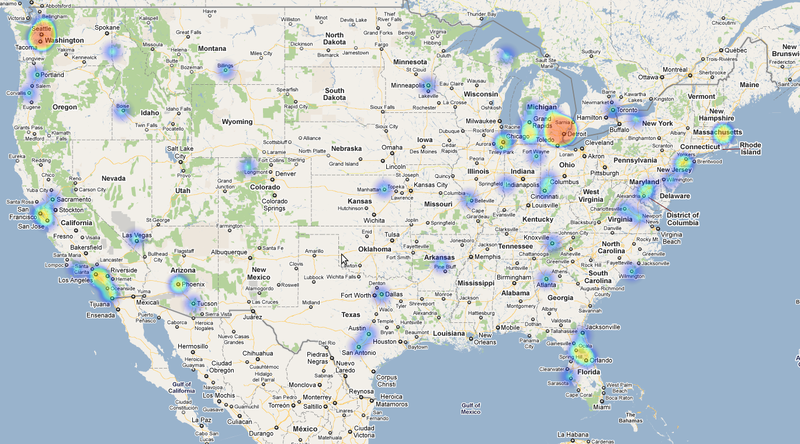 The maps show the general locations of where my Facebook friends are at. I was thinking I might just make a video of where everyone has moved to and from over time, but in the mean time, it's interesting to look at. What caught my eye about the newest map is how, according to Facebook, there is no place in the USA where I am more than about 400 miles away from a friend; unless I go to Northern Texas or North Dakota, I'll be even closer than that. In reality, I would never be more than about 300 miles away, if you include my friends in SE Colorado, Northern California, South Dakota, and Salt Lake City that don't use Facebook. So, there's a little update about what I'm thinking about right now. Also, while on the subject of Facebook friends, I find it odd that I have 324 friends on Facebook. That number is really just a running total of all the people I have interacted with (in person) long enough to remember their name (plus a few people I have never met that share my last name), but it just seems odd to have that many people listed as friends when I only interact with a small group on a regular basis. Perhaps I should begin to reevaluate the criteria for who is my Facebook friend, but if I did that, then I might not be able to find some random person I haven't seen in the past decade. A ferry leaves Friday Harbor under a moon lit sky. The clouds remain on the horizon, but stay at bay to avoid blocking the light. The water is smooth, the tailing wind makes for a silent night in the San Juan and Upright Channels. Large masses of black with the occasional orange or yellow light pass by on both sides. The glow of green and red lights are the only indicators of our course. As the ship passes Decatur Island through Thatcher Pass, the Rosario Strait presents a strong cross wind and the boat begins to sway. As we get into the middle of the Strait, the waves continue to grow larger, and the swaying becomes more dramatic. The waves crash on the side of the ship, causing everyone on board to grow tense. I stood out on the top deck. The wind threatens to remove my hat, and the lights of our destination begin to grow brighter. Shortly the captain will instruct me to go down to the lower deck, where Jaani is waiting in the car. Katy is reading a book in the passenger cabin, but I remain restless as I stare contently into the blackness. Our journey started at 6AM, we departed my home and set course for Friday Harbor. To get there, we had to take the ferry from Anacortes, and once we arrived we had another ship to catch. As it turns out, we will spend the majority of the day on the water. The entire day we were subjected to breath-taking views of the San Juan Islands, sunny skies, and the sight of the Olympic mountains on the Southern Horizon. The weather the past couple of days has been extraordinarily clear, and perfect for outdoor activities. Our goal was to watch sea lions on a large rock off the south end of San Juan Island, but the winds from the Strait of Juan De Fuca decided it would be more fun to throw 8ft waves at us. The 42ft boat just can't safely navigate around the jagged rocks close enough for us to get a good view. So, we returned to harbor, but not before finding a few sea otters and bald eagles just hanging around in their natural habitat. The day was so specular that a minor thing like not accomplishing the goal we originally set out to fulfill... well, it just seemed like a petty complaint not worth recognizing. We could not have asked for a better day... well, I guess we could have asked for less wind, but we had no rain, which is a rare find in January around these parts. Jaani was surprisingly good on the boat. The swaying side to side, and the waves crashing over the bow didn't seem to bother him too much, so long as someone was there to keep him from sliding off the chair. When we found an off-leash dog park not more than a couple miles from the ferry docks, he got so excited he started to drool and ran as fast as he could for almost half an hour. The past week has been full of events: The Aquarium, Pike Market, Pacific Science Center, Space Needle, Seattle Center, Experience Music Project, Woodland Park Zoo, Seattle Harbor Tour, Picasso at the Seattle Art Museum, day in the San Juan Islands... having a friend come visit, and giving a proper Seattle tour to a good friend, is one hell of a way to spend a week... well, actually 5 days out of a 10 day period. All I have to say- at the moment- is that I'm completely beat. So, I'm going to bed. I'm sure I'll sleep well tonight, so I hope you all will too.